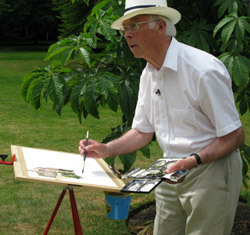 John is a master of pure watercolour, producing paintings bathed in light and atmosphere. 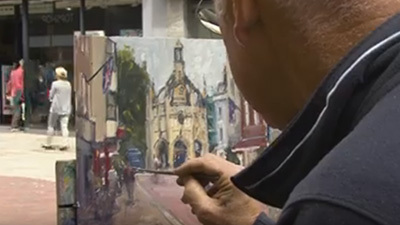 Working in the Cotswolds, he paints in the garden of Worcester College in Oxford and a view looking down Burford High Street. 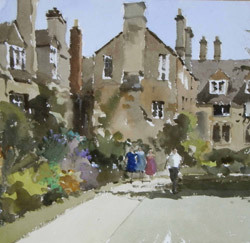 Painting in his studio, he then produces two wonderful Oxford scenes. He also shows us how he paints flowers; a stunning painting of Japanese anemones in a glass vase. 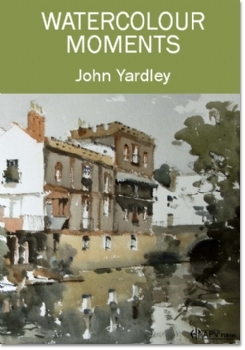 Watercolour Moments provides 90 minutes of insight into the practice of hugely popular artist, John Yardley. 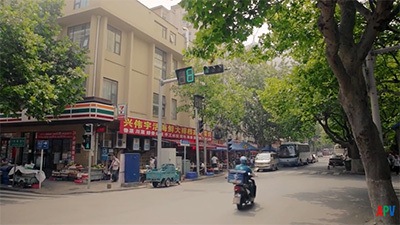 In this, his fourth film for APV, he works on five lively compositions. 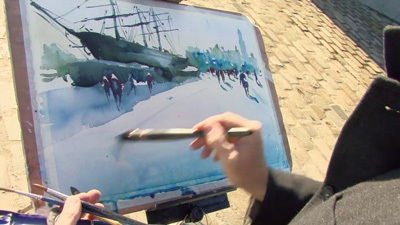 Each demonstration allows the viewer to understand fully how he approaches a painting, starting with a careful pencil drawing, followed by the application of colour to objects in the furthest distance. He then works intuitively across the painting, ensuring the balance of colour and tone, and avoiding any harsh lines to distract the eye. The first painting depicts Burford�s attractive high street, where, curiously, the beautiful golden stone that gives the town its character, creates a painterly disadvantage in its uniformity. 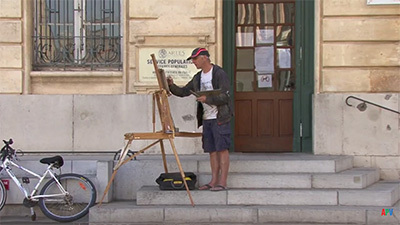 John successfully negotiates this by focusing on the variety of colour in the shops, awnings and figures. The garden of Worcester College in Oxford provides a contrasting view with its vibrant borders against the historic architecture. John explains how he prefers to work wet against wet to merge the colours and to maintain their strength, as opposed to wet into wet, which he feels makes the colours fade. Two further compositions, a castellated building across the river and a busy view of Oxford�s High Street, are worked from photos back in the studio, a practice he thoroughly endorse. As a total contrast, for his final painting, he selects some white anemones from his garden. John�s helpful commentary and gentle humour makes this a highly enjoyable and useful film. 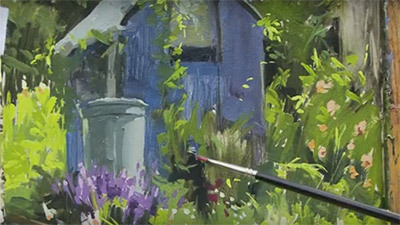 It is always inspiring to watch John Yardley at work. 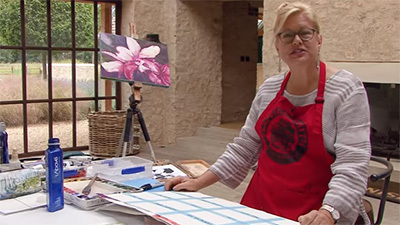 In his latest film Watercolour Moments he paints some stunning views and an exceptionally skilful painting of some Japanese anemones in a glass vase. Capturing the particular sense of light is John�s great strength and he often does this with just a few well-placed brushstrokes. 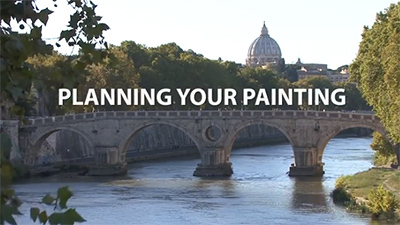 With demonstration paintings made on site and others made in the studio from reference material, this is the perfect film to entice you back outside and show you how to make the most of plein-air painting opportunities.